We are really proud to announce that we have inked a deal with superb spanish record label Xtreem Music for the release of our second album "Those of the Cursed Light". The album will be out on 15.03.2014!!! Spanish Black/Death masters FROZEN DAWN have inked a deal with Xtreem Music for the imminent release of their sophomore album, that will be entitled "Those of the Cursed Light". Hailing from Madrid, the band was formed back in 2006 and released a demo and an EP prior to their debut album "The Old Prophecy of Winterland" in 2011, and has been gaining a good reputation within the national Black Metal scene. 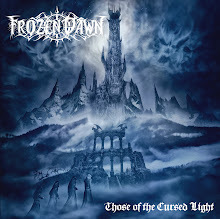 On this second album, FROZEN DAWN explores territories between Black and Death, before stepped by bands like NECROPHOBIC, WATAIN, DISSECTION, NAGLFAR, creating a truly astonishing album full of hits!! Every song is equally great, where tightness meets a perfect production, blending memorable melodies, that swing with sheer aggression, that any lover of the aforementioned bands will cry for. "Those of the Cursed Light" was recorded at Wintermoon Cult Studios by the own band, being mixed and mastered by Raúl Casarrubios at the same studios, with artwork made by Gragoth (Luciferium War Graphics). There's also a special collaboration by ex-NECROPHOBIC guitarist Martin Halfdan on the song "Blackened March".